Keep Fern Texture the Same! We as the players of Minecraft can not stand by to watch our games textures be forcibly changed without approval! As a community we must rise in a time such as now. The Fern, of the classic garden variety shown below, cannot be changed. They were our mini Christmas trees on holidays, our source of variation in a build, but most importantly our history. Forever changing the shape of the Fern will bury the past nostalgia of our Classic and True Fern. We can not stand for this tyranny, we must have our voices heard and our Fern kept True and Rightful. Comment below and share to take a stand and hopefully make an impact in the history of Minecraft. Most of the people who don't play minecraft stopped because they thought the textures were bad. The new textures have more detail and are more appealing to many. The textures aren't being forcibly changed. There are resource packs everywhere. Nostalgia is the remembrance of something of the past. I'm not really sure how you can be nostalgic about something that is in the present. If anything, the new fern will create nostalgia instead of burying it. Neither texture is more rightful than the other. It still gives the same variation as it did before, and you can create Christmas trees just as well. Ferns aren't a big part of Minecraft history. I haven't seen anyone who uses them other than occasionally in builds. Frankly, I like the look of the new fern better. The changes being made to the fundamental rules of MC which can not so easily be corrected are a far better ground to defend. Just because someone is able to use a texture pack to revert to the old fern textures, it does not allow the standard player on a server to see what the individual sees. Someones love of ferns will only go so far as client side and will be unable to be shared with the masses, sure the other players on a server could use your texture pack but lots of players will just use default. This makes the changing of the fern client side futile as then players will have conflicting point of views when it comes to a texture change such as the fern. 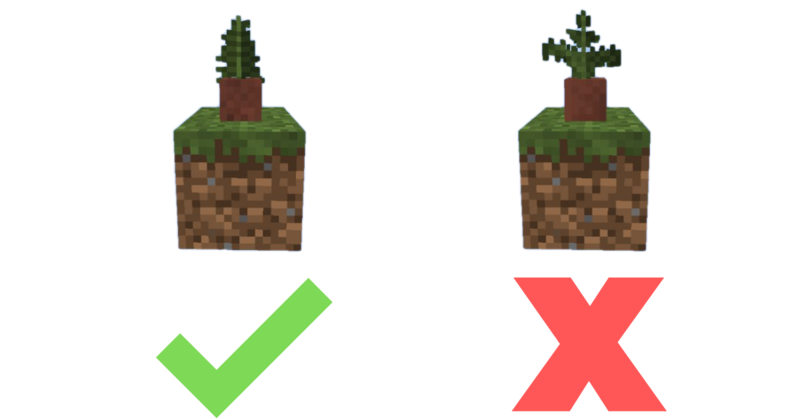 In turn, most blocks can be recognized across texture packs; however, the fern is a complete change of the shape thus the need to keep our beautiful legacy texture. So you say Minecraft players were "forced" to "watch" the fern's texture be changed without our say? Really? 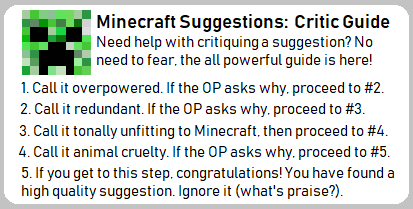 Then are you angry at Mojangcrasoft for "forcing" us to play 1.13, or 1.9, or 1.8, or any update in general? (Also, if you don't like the new textures, you can simply turn on the old ones. It's as simple as that. You should not be forced to play an outdated version simply because of one feature. This is especially true because of things such as forge that end their support for outdated versions, and that you can't play realms in an outdated version. If there are 50 great new features, but one intolerable one, I can't think of anyone who wouldn't be angry. They'd all be advocating for optionality or complete rollback of that one feature (like this thread). One bad thing should not have to disqualify a slew of good ones. I'd even go so far as to say that all features inessential to gameplay should become optional. That being said, I don't believe that the fern is really such a big deal as this thread suggests, and it is optional. But your argument that I quoted is ineffective. I don't see why they can't have both textures, which would increase the variety in world generation and plant life - just as instead of replacing roses I added poppies to TMCW (based on 1.6.4, the last version with roses, but that's not why I never updated from it, nor do I really care if they are different) so both of them are in the game, or I recently added two block tall plants but kept the one-block tall versions I made before (so there are three types of roses; the original single rose, 1 block bushes, and 2 block bushes, four if you count the cyan rose from an early version of PE). I also added more variants of other flowers, like more colors of tulips. Of course, you can always use a resource pack to change any textures that you don't like; I changed the lapis block texture to the one before 1.6, which was a brighter blue and didn't have a border, and changed a few other textures., so there is really no reason at all to complain about changes to textures; Mojang has even said that there will be a "classic" resource pack (of course, new blocks/items will not be changed because they simply didn't exist, thus there are no "old textures" for them, but that is true for all updates, and they receive far less attention than changes to existing ones). For comparison, the changes to world generation in 1.7 are one reason why I never updated, and such changes can only be undone with mods, even with the customization added in 1.8 (which was removed in 1.13). Most of the people who don't play minecraft stopped because they thought the textures were bad. Do you have anything to support this? I completely disagree. I have my experience of literally everybody I have talked to who either doesn't play Minecraft or has quit Minecraft listing the graphics as at least one reason for doing so. Concerning the suggestion... I don't know. Both textures look fine. On one hand, the newer one has more detail so it is nicer. On the other hand, the Christmas Tree shape is a valid point. But on the other other hand, the fern looks more natural in the wilderness. But on the other other other hand, the old texture communicates some level of nostalgia and it is a shame for a block to be so drastically reworked- remember whence Jasper said he wouldn't be changing the iconic textures? But on the other other other other hand, if we began a discussion on something iconic surely we must remember it is only a matter of time before more players see the new fern texture and become nostalgic over that. But on the other other other other other hand, the fern clearly had an impact on you which would suggest others felt the same way. Besides we can't start discussing things in the future if they have not yet come out. We can still change what the texture is. But on the other other other other other other hand, isn't what looks good and bad relative? So maybe one's own opinion does not matter at all because everyone will have a different opinion. But on the other other other other other other other hand, the original fern is crooked which when looked at by the most logical lenses is not very high quality. Beyond that it offers little shading or any of the sort. It looks like something who isn't good at texturing made it- which is true, it was made by Mojang. But on the other other other other other other other other hand, I can't decide. Let's just all use a resource pack. I spent way too much time deciding on something so trivial. Beyond that it offers little shading or any of the sort. I don't think every single texture in the game needs shading. Many avid Jasper texture fans claim the textures to be better, but what a texture looks like up close isn't as relevant as what it communicates in large quantities. Some textures clearly need shading, but almost all of the textures that need shading had shading in the original Minecraft texture pack. I beg to differ- the textures look much nicer this way. They now have depth and lighting. Yet at the end of the day we shouldn’t be arguing about this because art is interpretive. What I consider an improvement you consider a regression, and vice versa. That is why we are lucky to have resource packs.